A fun lesson in vocabulary to use for teaching your students about cooking. 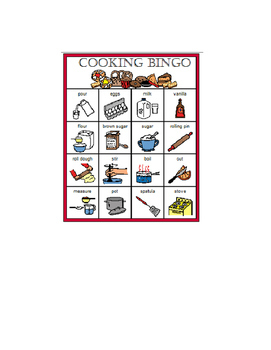 Cooking lessons are valuable ADL lessons that help students become more independent as adults. 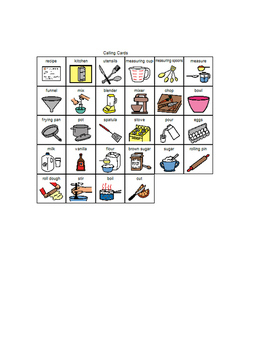 This lesson includes vocabulary of common recipe ingredients, common cooking terms (stir, chop, cut), as well as common appliances and kitchen utensils. Students will love this interactive game. 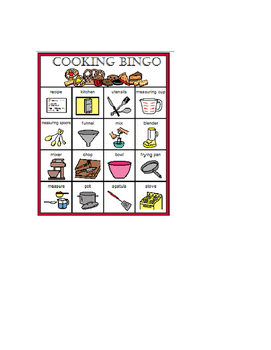 My students love Bingo games and it is a fun and easy way to differentiate learning in my Special Education classroom. Great for students with Autism, developmental disabilities, or ESL. Set includes 16 Bingo boards (all different) and one set of calling cards. This is a great way to assess what your students have learned through previous lessons. 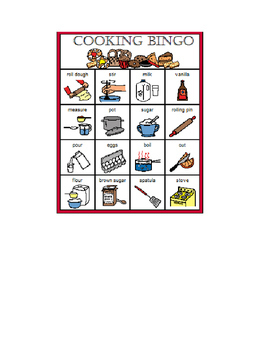 I would suggest printing, cutting and laminating the Bingo boards for durability.